Examples of my varied marketing communications work, presented in PDF. Trina Coy was a mom of two of my son’s school mates. She fought cancer for 3 years. Some families banded together to have a fundraiser garage sale and bake sale for the family to help them with their astronomical health care costs. I was asked to write an article for the local papers and to post the article on my blog to get the word out. Created for the Antioch Charter Academy II Memory Book Committee, this letter is given to local businesses to solicit support for the Memory Book. Created for Homeless Animals Lifeline Organization, this was the first volunteer newsletter for the group, and served as a template for other newsletters. Created with input from the Nashua Theatre Guild Board of Directors, this brochure was included in the welcome packets sent by the City of Nashua to new residents. My work resulted in higher market penetration and better box-office results. Each of these nine ads were created specifically upon request by organizations seeking ad space in NTG playbills. Some images and text were supplied by the organizations. 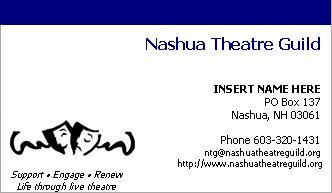 Created by request by the Nashua Theatre Guild Board of Directors, this card includes the new logo for NTG, which I helped to create. Created for the Guild’s annual evening showcasing new directors. Created for the eTravel Product Management team, this newsletter was sent to travel personnel at customer companies upon a new release of the product.